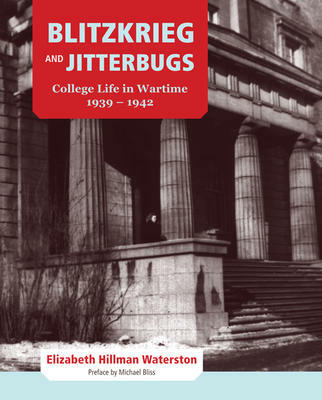 In Blitzkrieg and Jitterbugs, Elizabeth Hillman Waterston gives us a very particular picture of what it was like going to university – McGill – while the country had just started World War II. She entered McGill in September l939, the month war was declared. The first eight months moved slowly with the defeat of Poland, war in Finland, and battles on the sea and in the air. By April l940, Hitler’s blitzkrieg brought the fall of France, Dunkirk, the Battle of Britain, and ended with the invasion of Russia and Pearl Harbour. All this time, Elizabeth headed out from Montreal West by bus or street-car to college, where she was sorting out her lectures, getting to know the professors, going to freshie dances, and trying out articles for the student paper, The McGill Daily. Certainly the headlines brought the war news, and students across campus were also wondering which young professors would be joining up, and most of all, which of their family, and men friends, would leave the campus. The book brings out the strong contrast between the frivolous insistence of youth “to have a good time at college” and the darkening demands from overseas. With diaries and scrapbooks, and a natural ability to report what she saw – and now remembers – Waterston gives a very intimate portrait of these days. It is certainly a pleasure to read for anyone who was at university at this time. She shares photos and newspaper clippings, and altogether brings the period very much alive. Waterston herself became a Professor of English, and taught at Sir George Williams, the University of Western Ontario, and the University of Guelph, where she is presently Professor Emeritus.